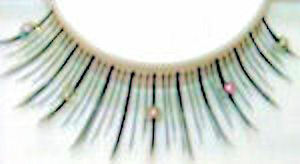 Red Cherry Eyelashes ~ Glitz And Glamour You sparkle when you enter the room. Your eyes have become the center of every one's attention. You love the looks coming your way. The compliments don’t hurt either. Events like these occur frequently when wearing Red Cherry Eyelashes (5MP1). The glitz and glamour that accompany these lashes are sure to make you smile each, and every time, you leave home. As you step out into the sunlight your eyes sparkle with beauty. The rhinestones reflect the rays of light, and send out pretty little beams of charm to the world. People notice you, and you notice them back. Your new Red Cherry lashes really work. You’ve never been so impressed with all the attention you’ve received in just one day of wearing them. Created using our finest synthetic fibers, Red Cherry lashes offer glamour at an affordable price, available to anyone. Before you apply, don’t forget to buy your eyelash adhesive. We have some suggested products below that will do the trick.